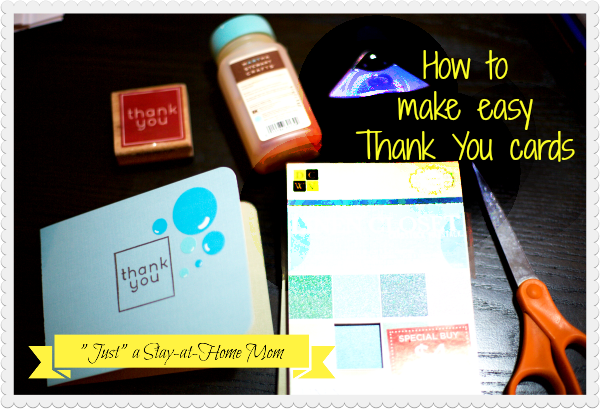 I have always enjoyed sending Thank You cards. Mainly, I enjoy the excuse to relive my childhood memories or writing hand-written letters. * I had 3 long-distance pen pals I wrote to throughout grades school. I miss the excitement of getting an envelope in the mail. The only thing I don’t like about sending cards is that they are often SO expensive. When I don’t have time for crafting, buying cards at the Dollar store is my go-to, but that still leaves you at $1/card. So, here’s an easy way to make your own for about $0.25 / piece.